Ever wondered how big is social media? 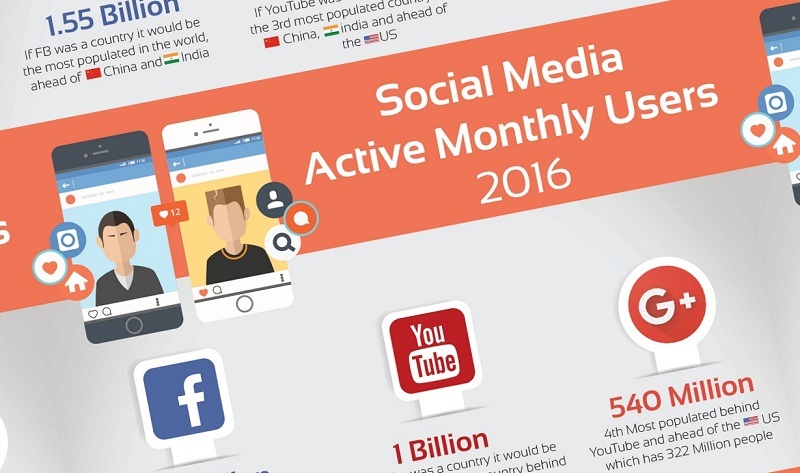 What if I told you the total monthly active users of the top 8 social sites is around 4.2 Billion. WOW! That’s right – this is only users from the big social sites like Facebook, Twitter, YouTube, Instagram, Pinterest and LinkedIn. Smaller sites like StumbleUpon with 30 Million monthly active users do not even feature in this list and now you can see the power of social media and its influence. Rather than presenting you just numbers, we wanted to rank these social sites in terms of population of the world. Assuming the top social sites were countries, how would they rank relative to countries like China and India? Would you believe Facebook would outrank both India and China with its huge user base of 1.5+ Billion? Here is an infographic from YourEscapeFrom9to5 that shows Social Media by the numbers with a fun take on the world’s population. Social Media is growing whether you like it or not. Brands will use social media to build up their name and socialize their products. Of course, like all good things social media does have its dark side like cyber bullying, fake accounts and selling fake followers. How are you going to take advantage of the imminent social media storm?